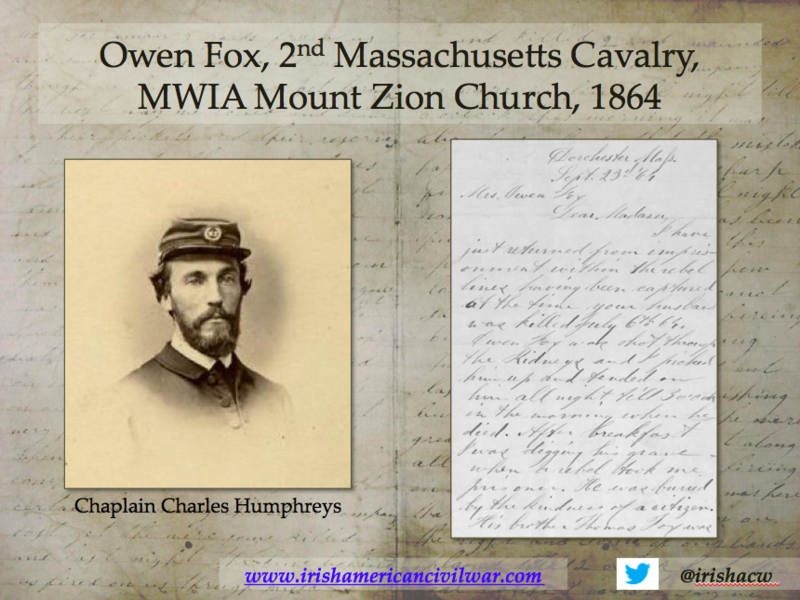 As regular readers are aware, my research over the last number of years has focused on identifying and analysing the correspondence of Union Irish soldiers in the American Civil War. 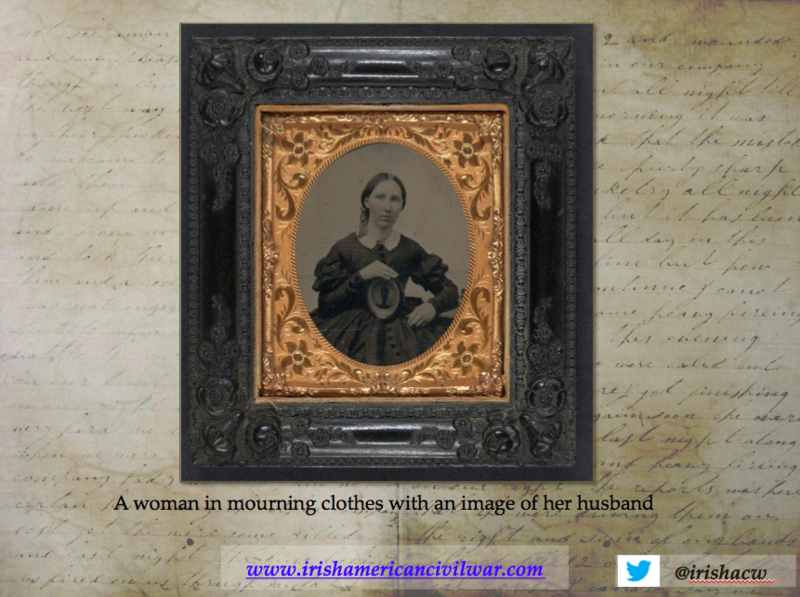 Over the course of my work I have read hundreds of letters written to Irish families to inform them of their loved ones’ fate, and this correspondence has increasingly fascinated me. There are many questions we can ask of it, and I intend in the future to develop some of them into a full-length paper. 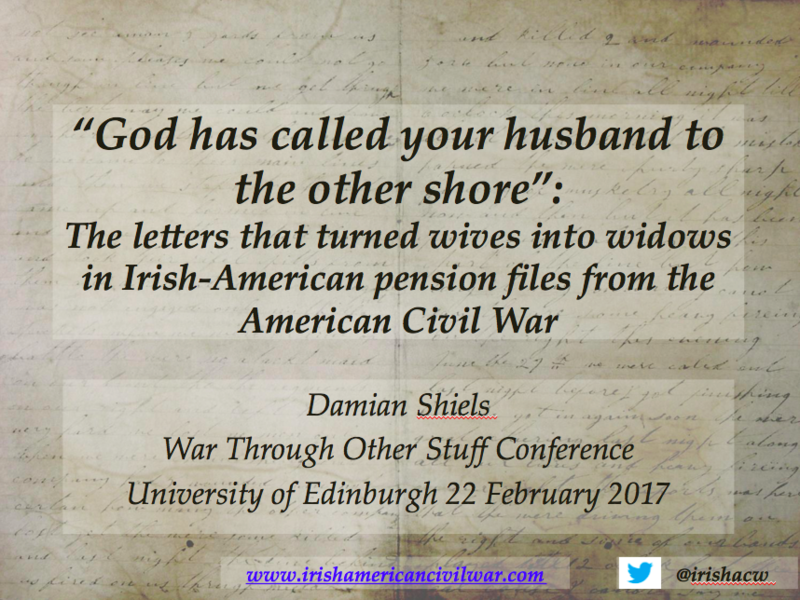 In 2017 I was fortunate to have an opportunity to flesh out some of my thoughts in this area at the excellent War Through Other Stuff Conference held at the University of Edinburgh, Scotland between 22 and 24 February. I wanted to take the opportunity to share the full presentation with readers of the site; the paper is reproduced in full below together with the slides from the accompanying powerpoint presentation. The National Archives in Washington D.C. is home to a collection known as the “Case Files of Approved Pension Applications of Widows and Other Dependents of the Army and Navy Who Served Mainly in the Civil War and the War with Spain.” Each of these files-of which there are 1.28 million- contains documentation associated with the claims of individuals for financial support as a result of the death of a family member who had served in the U.S. military, the vast majority during the American Civil War. The files have their genesis in an act signed into law by Abraham Lincoln on 14 July 1862, which provided monthly pensions for both widows and men totally disabled by conflict. In the years that followed, a series of additional pension acts expanded and refined the initial entitlement criteria, part of which saw the inclusion of dependent parents, dependent siblings and minor children. The wide-ranging pension entitlements that became available to both Civil War veterans and the families of deceased servicemen in the decades following the war created oceans of documentation, unsurprising given that by 1893 some $165.3 million dollars a year- or 40% of the entire Federal budget- was being spent on pension entitlements. As a result, these files are perhaps the richest source of social information on individual families from the 19th century United States. 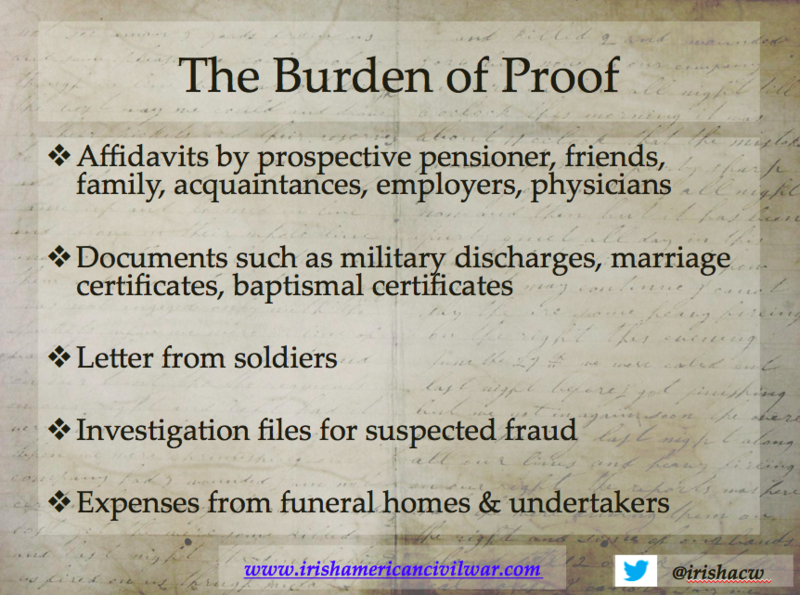 That richness lies in the material that widows and dependents had to submit in order to demonstrate their pension entitlement, which included things such as affidavits, marriage certificates, baptismal certificates, proof of service, medical appraisals, and original letters written by deceased servicemen. 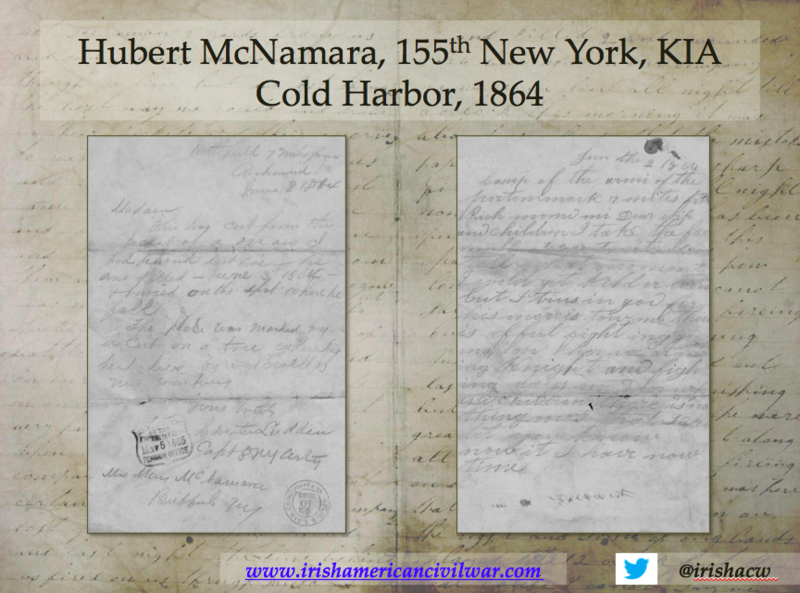 Over recent years the focus of my research has been on these pension claims, particularly with respect to what they can tell us about Irish emigrant communities in the United States. This work has largely been conducted on the 11% of files that have been scanned and are available via the Fold3 website. 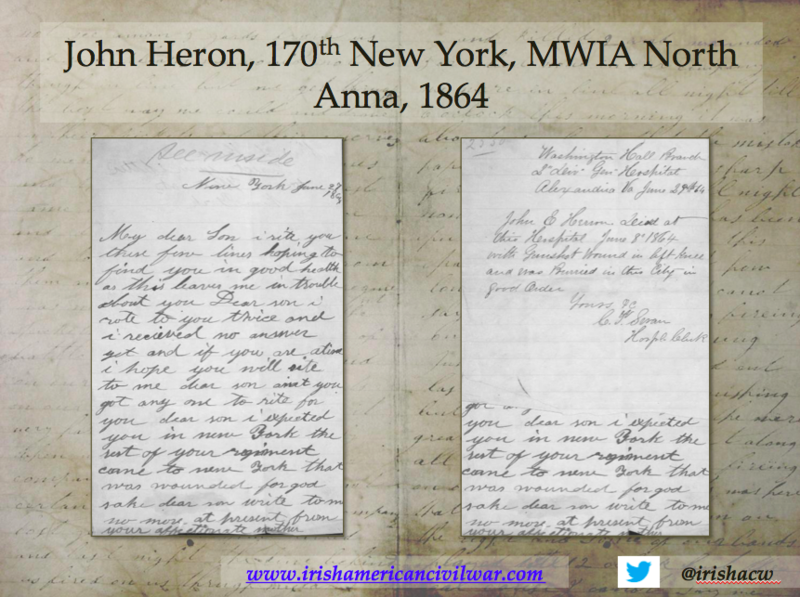 During my work I have created a database of hundreds of Irish-American letters written before, during and after the conflict. Contained among much of this correspondence are letters that are the focus of my paper today, namely the communications informing families that their loved ones had died. I don’t wish to address to you the common words of condolence merely- I feel, myself, as well as you, too much the greatness of the loss. 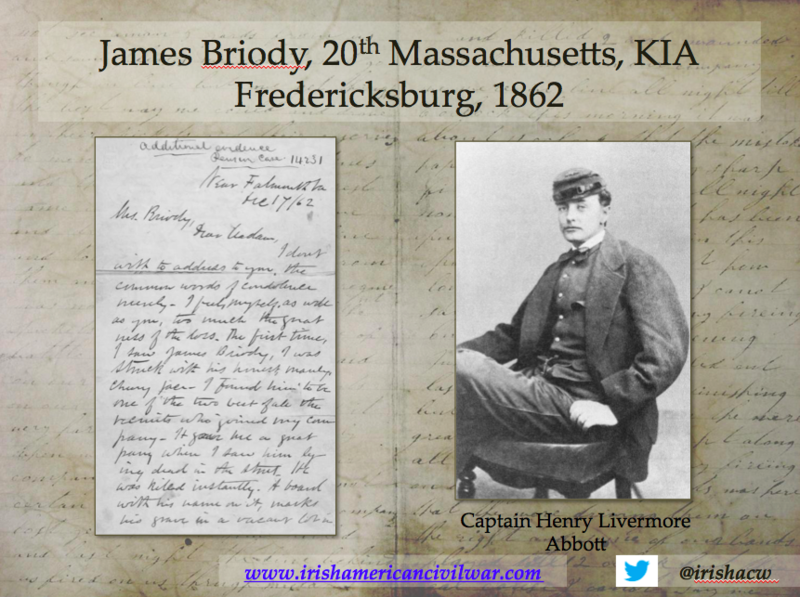 The first time, I saw James Briody, I was struck with his honest, manly, cheery face. I found him to be one of the two best of all recruits who joined my company. It gave me a great pang when I saw him lying dead in the street. perfectly resigned to his fate. When I informed him that he must die he said “welcome be the will of God I could not lose my life in a better cause”…he was perfectly rational to the last and died like a good soldier and Christian. Owen Fox was shot through the kidneys and I picked him up and tended on him all night till 3 o’clock in the morning when he died. After breakfast I was digging his grave when a rebel took me prisoner. He was buried by the kindness of a citizen. His brother Thomas Fox was taken prisoner not wounded. The Chaplain’s brevity obscured some of the wider details of Owen’s death, which he elaborated on in his memoirs of the war, published in 1918. There he revealed that Owen had in fact surrendered to the Confederates, and had been shot by them while he begged for mercy. 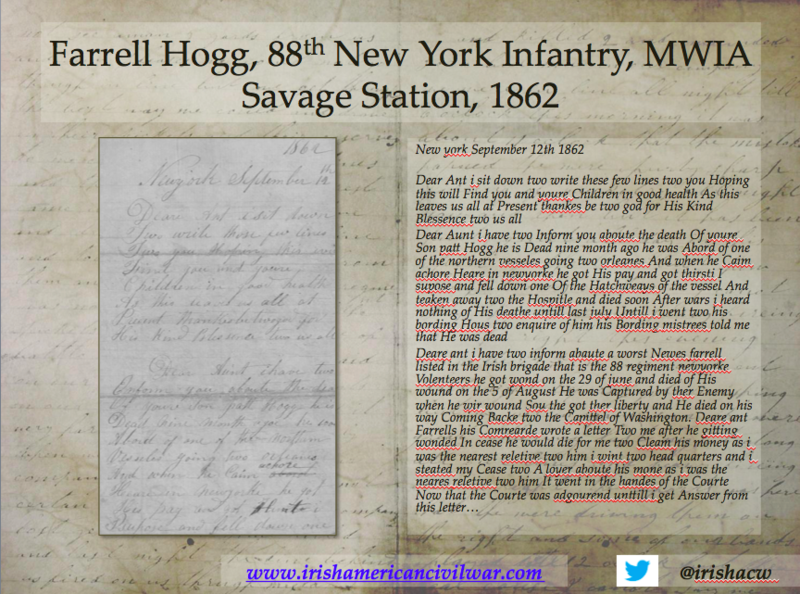 As he treated the soldier’s “ghastly wound” he tried to get a message from him for his wife and child, but his “agonies were too great; and he kept crying out even with his dying groans, “Chaplain, they shot me after I surrendered.” In his original letter, Humphreys had chosen to spare Owen’s widow these distressing details. He did not speak while in the hospital being unconscious, but from his having on the scapulars we knew him to be a Catholic and sent for the priest who gave him absolution and anointed for death. My dear son I write you these few lines hoping to find you in good health as this leaves me in trouble about you. Dear son I wrote to you twice and I received no answer yet and if you are alive I hope you will write to me. Dear son ain’t you got anyone to write for you? Dear son I expected you in New York, the rest of your regiment came to New York that was wounded. For God sake dear son write to me. John E Herron died at this Hospital June 8 1864 with gunshot wound in left knee and was buried in this city in good order. 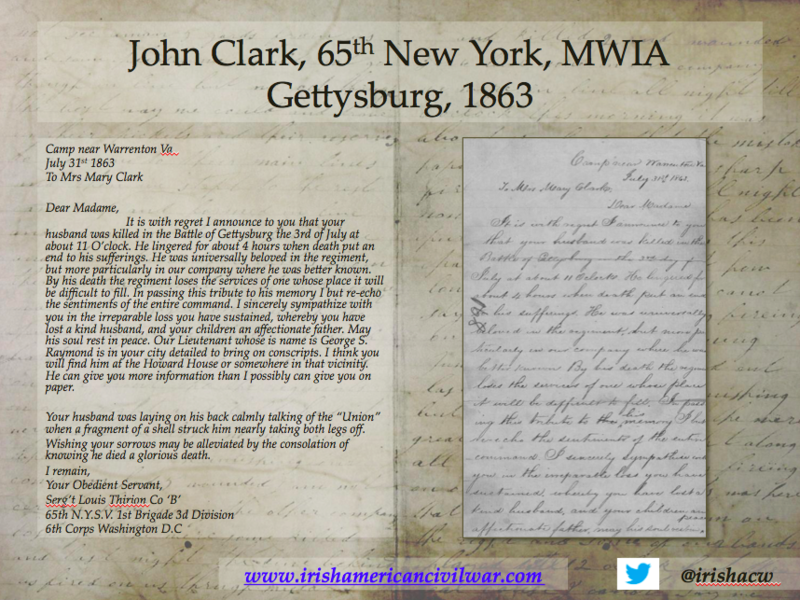 For a fortunate few, the letter informing them of their loved one’s death might also have brought some final words. 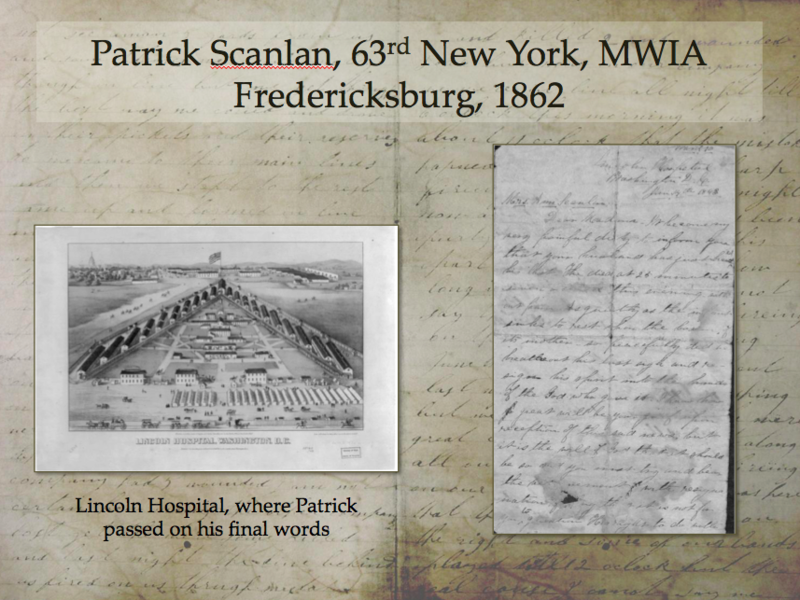 When Mary McNamara was informed of the discovery of her husband Hubert’s body on the Cold Harbor battlefield, the writer included fragments of a last letter that had been found in the dead man’s pocket. It told of how Hubert didn’t know the moment he might get killed or wounded, but that he trusted in God. He signed off by telling his wife and children “goodbye for a while”. He felt sensible, I think, that his end was approaching for he requested me to make a note of his feelings at that time- this was yesterday forenoon, I think. He did not talk a great deal as it hurt him to do so much. 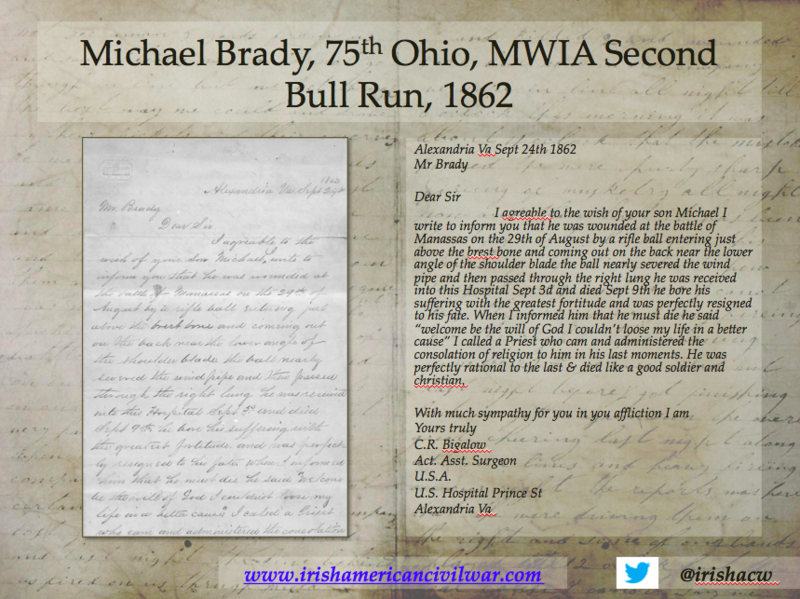 “After I am dead, write to my wife and tell her that I died a natural death in bed, having received the full benefits of my church.” “Say that I felt resigned to the will of God and that I am sorry I could not see her and the children once more. That I would have felt better in such a case before I died. It is the will of God that it should not be so, and I must be content to do without.” This was about the substance of what he said. I read it to him and he said it was all that would be necessary to write. Time constraints have allowed us only a brief exploration of this resource, selecting only a small number of examples from the thousands in the files. Their analysis can expose for us how news of death in war was transmitted, received and in some cases dealt with in the 19th century. 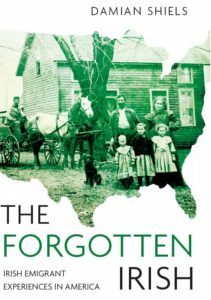 Perhaps most importantly, it shines further light on the scale of human cost of the American Civil War on Irish emigrants and their families, both in Ireland and the United States. Interesting article. 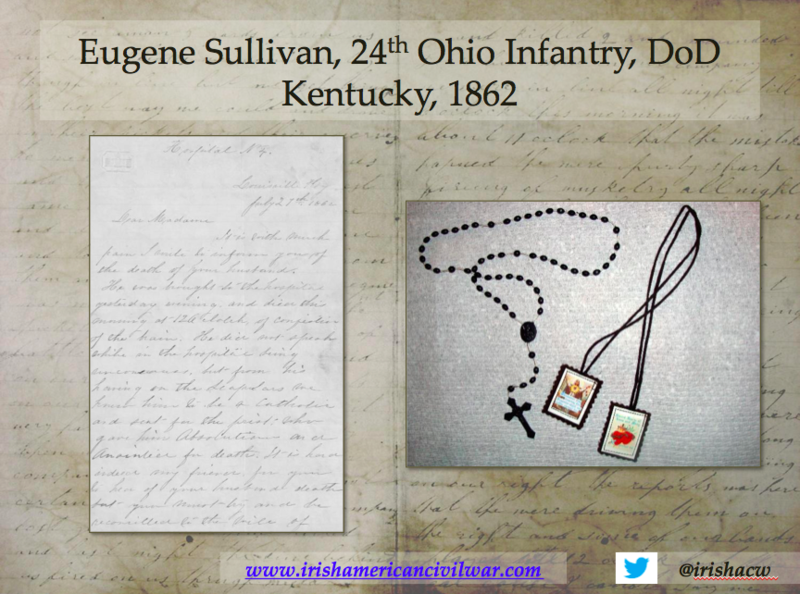 I wish it were possible to read the letter to the family of Eugene Sullivan, Ohio 24th Infantry, DoD Kentucky 1862. My great-great grandfather was a Eugene Sullivan from Michigan who must have enlisted in a Union Army unit from another state, as there are no Eugene Sullivans listed in any of the Michigan units on the US Park Service Soldiers and Sailors website. Would love to read that letter to help determine if my Eugene Sullivan could have enlisted from Ohio instead. The State of Michigan couldn’t afford to support all the men from Michigan who wanted to enlist. Many found positions in other states’ units. The later generations of our family have no information on what happened to him. I have been trying to answer this question for many years.